Think sari and what comes to mind is a classically draped, elegant looking piece of cloth. But, let's think sari again. 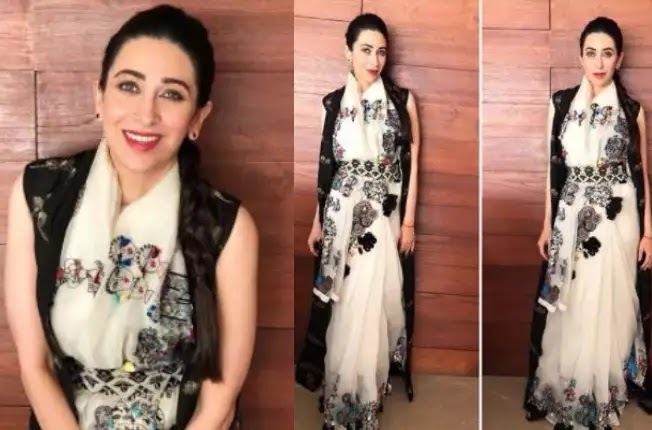 Enter Karishma Kapoor with her daunting and bold sari look. That's the thing about this classic wear, it can be experimented in a zillion ways and trust us when we say, it looks damn gorgeous every possible way. Karishma looked every inch a stunner in this experimental drape by Anamika Khanna. The sari had beautiful, multi-coloured print which bordered on agypsy style. The look is a modern take on the vintage sari with the pallu of the sari draped around the neck like a stole. It was held together with a printed, black belt. To make the affair more modern, she boldly paired it with a classic black floor-length jacket. Without a doubt, the two-level experimentation is a win-win. She kept the accessorization minimal and paired the sari with very basic black dot earrings. She flaunted the look with a classic braid. The actress was styled by Eshaa Amiin. 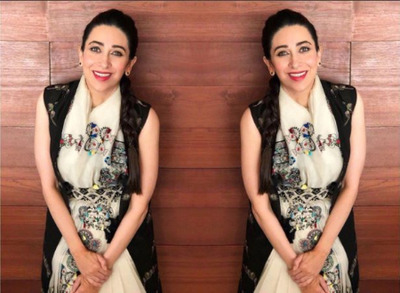 Making another case for drapes, Karishma wore a Sabyasachi dress in Delhi. In an all-black look, high-neck dress with vintage and bold embroidery around the neck, she looked every bit classy. Again, she kept the look minimal by pairing it with dot earrings and a crown braid. Her chic black and golden heels were by Giuseppe Zanotti.